Can Seasonal Allergies Make You Cough? 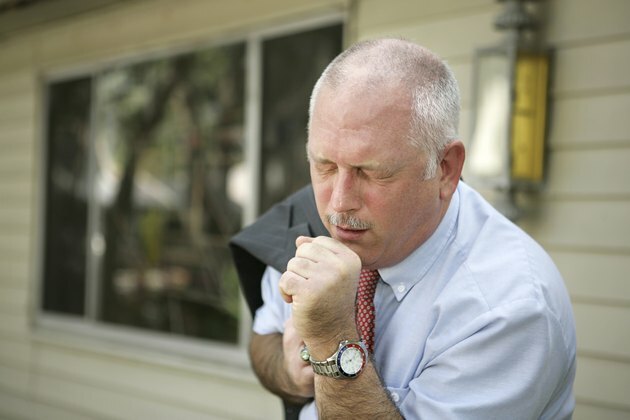 If you have a chronic cough, you’re not alone. Coughing is a symptom of seasonal allergies, and more than 50 million Americans deal with allergies every year, according to the Centers for Disease Control and Prevention. Once you identify allergies as your cough’s source, your doctor can recommend various medications to treat it. The best way to stop coughing due to allergies is to eliminate the source, such as ragweed, pollen, dust mites and animal dander. Seasonal allergies contribute to one of the three major causes of chronic cough -- upper airway cough syndrome -- according to a medical study of coughing by the Work Loss Data Institute. Asthma and gastroesophageal reflux disease are the other two, so you’ll need to consult a doctor to determine why you’re coughing. If your cough isn’t chronic, defined as a cough lasting at least eight weeks, it could be due to the common cold, the flu or bronchitis. Coughs also could come from other sources such as lung disease, smoking or a psychosomatic condition. If you have trouble breathing, the cough keeps getting worse or it doesn't respond to treatment, consult a doctor for advice on your cough’s source. Allergens such as pollen trigger your immune system to make antibodies that can lead to the production of chemicals in your nose and sinuses, causing them to swell and produce mucus, according to the American Academy of Allergy, Asthma and Immunology. If post-nasal drip results, it can lead to irritation in your throat and coughing to expel mucus. Allergens can also cause your immune system to trigger a reaction in your lungs -- allergic asthma, according to the U.S. National Library of Medicine. The lining of the air passages in your lungs thickens, and the muscles tighten around the airways, making it difficult for air to pass through. The result can be a chronic cough. Most health-care practitioners can offer skin or blood tests to determine whether your cough is due to seasonal allergies, according to the U.S. National Library of Medicine. Doctors have a variety of options to treat your symptoms. Antihistamines can help clear up the mucus that leads to the cough. Cetirizine (Zyrtec) and fexofenadine (Allegra) are available over the counter. Corticosteroids such as dexamethasone and prednisolone (Orapred, Prelone) can treat more severe allergies. Allergy shots help your body build up an immunity to the allergens, according to the U.S. National Library of Medicine. The best way to prevent an allergic cough is to avoid pollen or other offending allergens, according to the CDC. During spring and summer, you should stay inside when you can, keep the windows shut and the air conditioner on, according to the U.S. National Library of Medicine. Wash up and remove clothes when you come inside to eliminate pollen. Avoid pets, as they’re a source of dander that aggravates allergies. Put hypoallergenic covers on pillows and mattresses to repel dust mites. Air purifiers can also help remove allergens from inside air.